After our very successful Kickstarter campaign for the BI V2.0 3D printer we immediately decided to re-invest and vastly improve the proposed design. The number of upgrades and improvement was such that the new machines would be versioned as BI V2.5 to reflect these advances. In this article, we aim to document the major improvements between the BI V2.0 and the new BI V2.5. As V2.5 is being finalized this article will be kept current and updated with the latest pictures and information. The original V2.0 featured ¾ inch hollow aluminium extrusions and 3D printed structural corners that required a metal insert to reach the desired rigidity. Hollow aluminium extrusions where selected for their low cost and their ability to conceal electrical wiring to create a cleaner look. 3D printing of the structural corners was an interesting approach for small production runs, but was quickly determined to be unsuitable for a burgeoning Kickstarter production run of more than 300 units. Indeed, each corner would take approximately 10 hours to print and there existed four corner variations. With 6 corners per printer, that meant that each V2.0 required more than 60 hours of print time just for the structural frame! 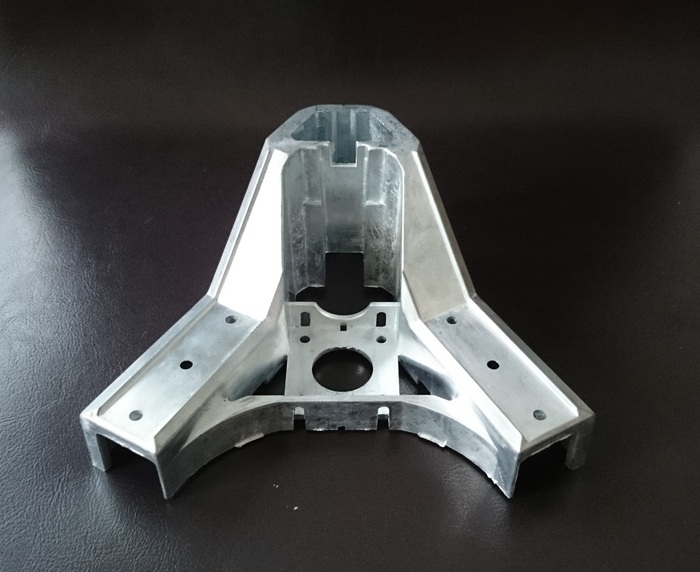 V2.5 now features structural corners that are similar in function, but are molded in a zinc alloy to allow for a reduced production time, improved rigidity and better tolerance. To accommodate the molding process, the corners were modified with thinner walls and an opening on the bottom to install the aluminium structural beam effortlessly. 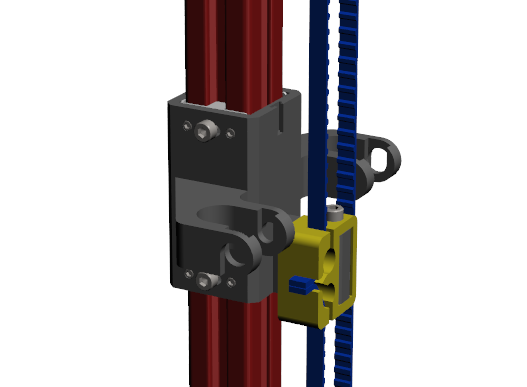 Another major change is that in V2.5 the structural frame now uses the 20/20 aluminium extrusion system. These 20/20 components are widely available and using them simplifies the fastening of structural beams to structural corners. Lastly, to create a more streamlined look, the axis limiting switch was moved from the outside to the inside of the structural frame. Another area of improvement for V2.5 is the positioning of the bottom structural corners and the print surface support system. 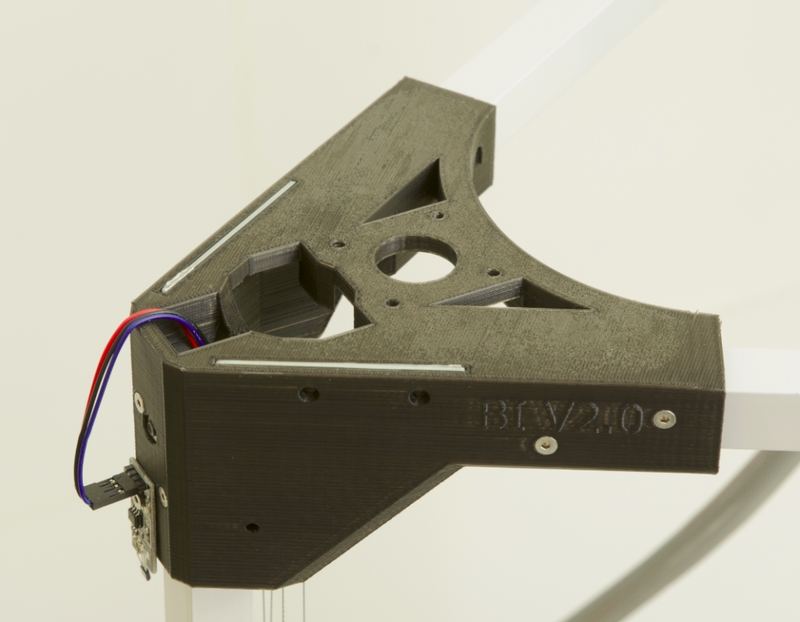 In V2.0 we had the structural corners in the upright position lying flat on the ground and 3D printed clips were added to the bottom horizontal aluminium extrusions in order to support the circular print area. A macro adjustment mechanism was included in each 3D printed clips to level the glass pane. V2.5 saw the inversion of the bottom corners to allow the use of the bottom horizontal aluminium extrusions for supporting the circular print area. In addition, a laser cut acrylic surface is introduced to allow for the fastening of all electronic components underneath the print area and hidden from view. A slightly more sophisticated leveling system is implemented with three screws and dampening springs that provide an additional layer of protection in the event of a head crash against the glass. Dampening inserts are installed under each corner to reduce the effect of vibration and prevent slippage of the unit on its resting surface. V2.0 was comprised of three vertical aluminium beams that served the additional purpose of linear motion components. Our novel approach with V2.0 was to 3D print a custom shaped PLA linear bearing that would fit and glide directly along the vertical aluminium extrusions. 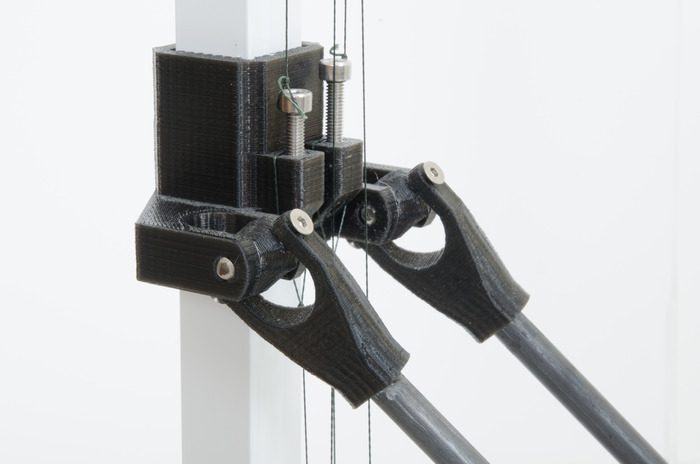 To prevent any displacement of the carriages (the components sliding up and down) along the axis perpendicular to the circular build area, we introduced the auto-balancing triple pulley cable system. This new approach generated savings by removing the need for expensive linear rails. In addition, the noise generated by the smooth motion of the carriages along the aluminium extrusions was very low. One disadvantage of cable driven systems was their time-consuming installation, which is unsuited for larger production runs. 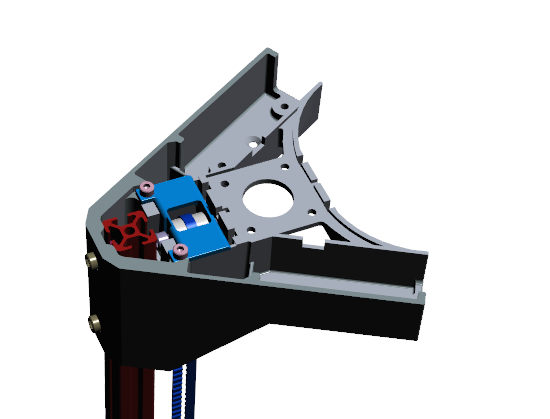 V2.5 also relies on a custom shaped linear bearing as well as using the vertical aluminium extrusions as motion components. However, in V2.5 the carriages are injection molded in POM (an engineering thermoplastic with very low coefficient of friction) and match the outline of the 20/20 extrusions. Furthermore, an adjustment mechanism is present in each axis to ensure the carriage is conforming perfectly to the 20/20 extrusions. The result is a linear motion system with very little play and as such there is no longer a requirement for the triple pulley system. For this reason, and for ease of manufacturing, V2.5 ship with a classic belt system. V2.0 featured a 3D printed PLA delta platform with a hotend mounting system that relied on an acrylic insert for support and a 3D printed PLA top plate to secure everything in place. This approach worked relatively well, but did not allow for hotend adjustments that are necessary to ensure perfect vertical alignment of the print heads. In addition, the PLA platform was prone to heat deformation over time. 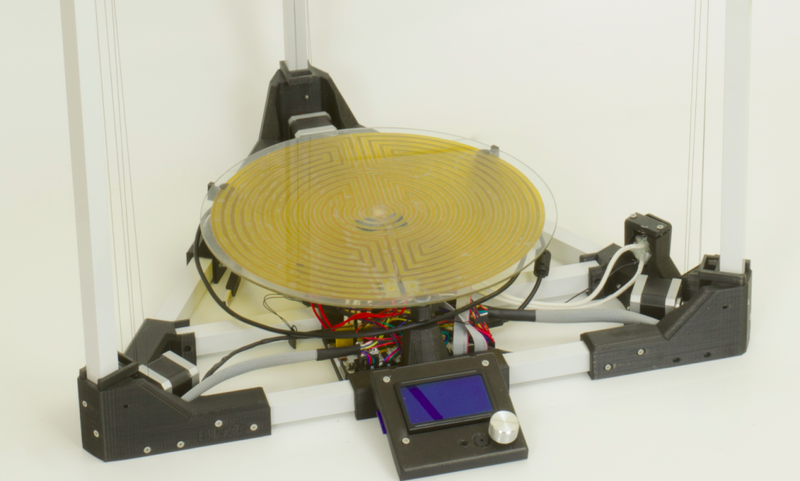 Cooling fans were mounted on the periphery of the platform in order to cool both the object being printed and the hotends. The auto-levelling probe was mounted directly in the center of the platform in the same slot as the hotends. This limited the system to a maximum of 2 hotends whilst using an auto-leveling probe. Having such a large print area, it became apparent that the auto-leveling probe was required at all times. The delta platform in V2.5 addresses the fundamental issues of V2.0. 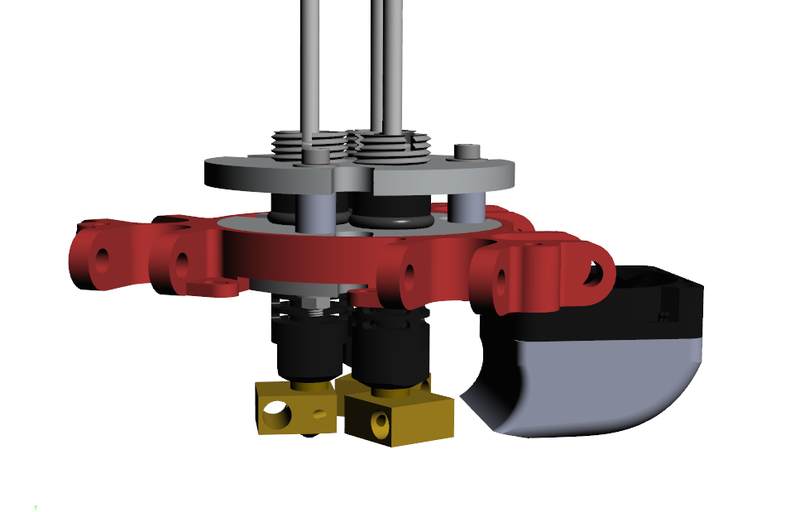 The new system allows vertical hotend adjustments and is also injection molded out of fiberglass reinforced engineering ABS (which improves heat resistance). The major breakthrough with V2.5 is the hotend vertical adjustment system which ensures that all print heads are perfectly aligned for multiple extrusion prints. 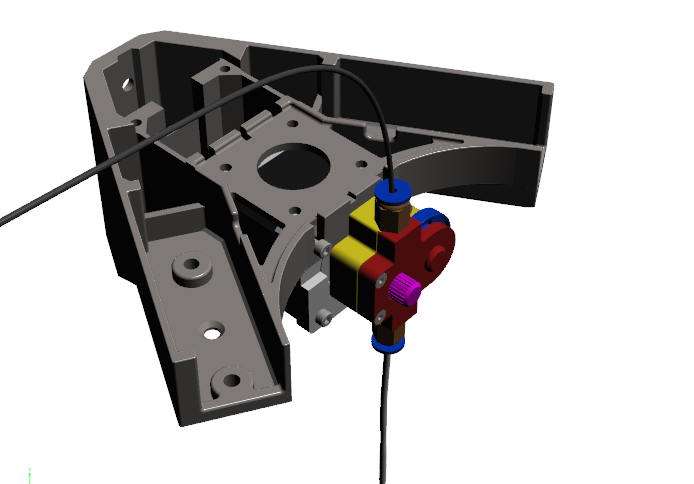 This system is comprised of laser cut aluminium plates that support the hotends. The vertical adjustment is possible by introducing a rubber O-ring gasket between the hotend and the adjustment point. The compression distance of this gasket is enough to allow for the necessary adjustments between print heads. Other modifications include the addition of accessory mounting points on the periphery of the platform. This is where a fan can be mounted to support dual extrusion cooling. The auto-levelling probe, if present, is also installed in periphery to free the third hotend hole (V2.0 previously mounted the auto-levelling probe in one of the hotend slots). The V2.0 extruder is largely derived from our previous work on V1.0 which is itself derived from other widely used open source designs. It worked well, but we felt that it could be further refined for V2.5. 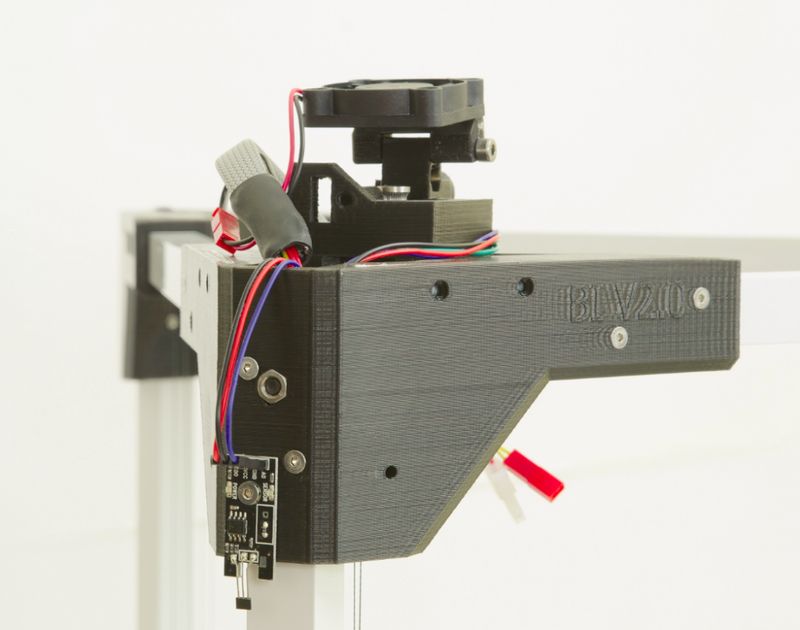 In V2.0 the extruder was positioned on the top of the delta tower and relied on a fan to prevent heat exchange between the stepper motor shaft and the filament. When heat transfers to a filament that is not moving for an extended period of time it can become soft and lead to stripping, which in turn leads to extruder failure. Using a fan that blows cold air directly onto the filament is an effective strategy to avoid this failure mode. In V2.0, springs were also used to tension a bearing against the extruder driver wheel. These springs provided dampening and accommodated filaments with diameter variations. 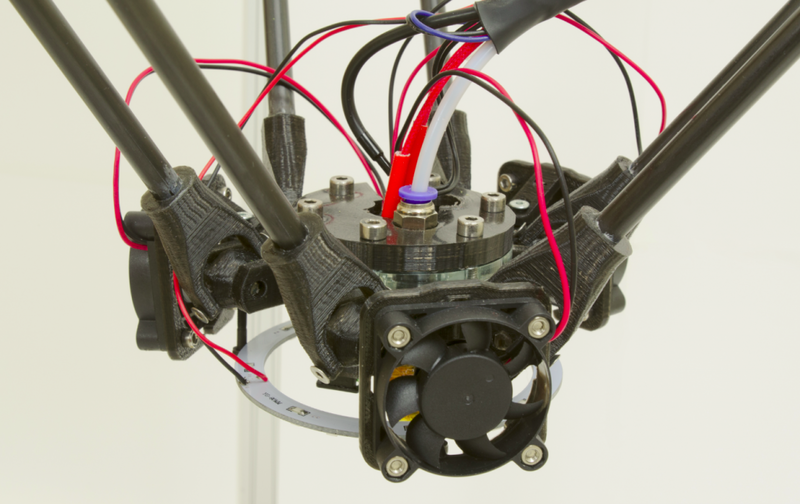 V2.5 sees a major improvement in the positioning of the extruder and the removal of the cooling fan from the design. Positioning the extruder inside the frame streamlines the design and frees the top of each delta tower for other accessories such as spool holders. By using high-quality drivers such as the DRV8825 and better stepper motors that are finely tuned for the extruding application, it is possible to reduce stepper motor heat and remove the cooling fan from the equation. Another modification to V2.5 is the use of a self-tensioning injection molded wheel that combines the roles of the springs and the tensioning bearing in one part. We’ve always wanted to include a large LCD for standalone control with our 3D printers. In V2.0 we used a full graphic Smart Controller that contains an SD-Card reader, a rotary encoder, and a 128 x 64 dot matrix LCD display. 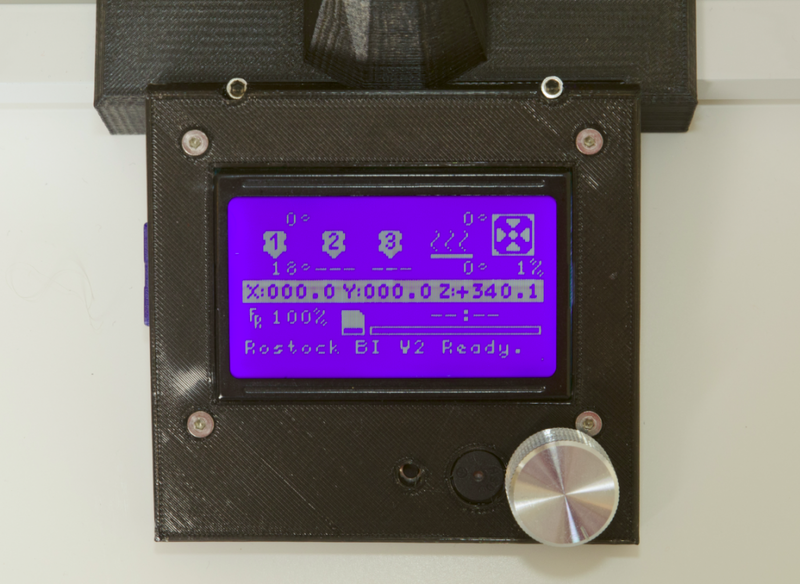 This LCD is enclosed in a relatively unrefined 3D printed PLA enclosure. With V2.5 we kept the same outstanding LCD controller, but we took the time to redesign the LCD case to a standard that is more in line with our vision. 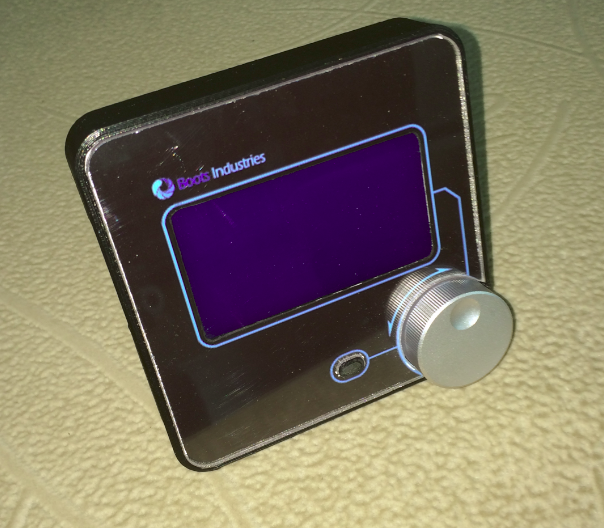 The result is a beautiful 3D printed enclosure with aluminium backing and acrylic front. The transition between V2.0 and V2.5 is detailed in this article. At Boots Industries we believe in collaboration and sharing with the community. As such, we will continue to update this article with the latest information and publish further articles. Thanks for reading!